Jupiter will be at opposition (opposite the Sun in our sky) in late October. This is when it is closest to Earth and therefore largest and brightest. It’s around this time it becomes very noticeable as a bright yellowish beacon in the east as it gets dark. You cannot mistake it for any other object as it is far far brighter than any star. This is also the time when every astrophotographer tries to get good images of Jupiter (and its four Galilean Moons). I’m no exception. I’ve taken a few images of Jupiter before but I don’t really have the right telescope for planetary imaging. Telescopes with long focal lengths (high focal ratios) are usually better and I have a short focal length widefield telescope as my main instrument. This doesn’t deter me from trying of course and I have a DMK 21AU04.AS camera for just this job. The camera takes monochrome avi videos of whatever it sees and by taking the individual frames from the video and stacking only the very sharpest you can beat the seeing. Seeing is where the object you are watching wobbles about and flicks in and out of focus due to air currents in the atmosphere. The other evening (24th September) I used the DMK camera, my 200mm F/4 Newtonian telescope, Astronomik RGB filters in a filter wheel and a Televue 5x Powermate to take three videos of Jupiter of 1000 frames each at 30fps. One through a red filter, one through green and one through blue. This gives a decent number of frames to work with in a not too massive file. The Powermate makes Jupiter a decent size on the imaging chip, we want to cover as many pixels as possible to get the maximum amount of detail. By stacking the best 1/3 of the frames in Registax software I obtained three monochrome images of Jupiter. The clever bit comes when you combine these three images together, making the monochrome image taken through the red filter monochrome red, green as green and blue as blue. When you do this, as if by magic you get a colour image of Jupiter! 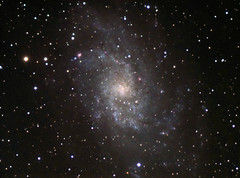 I used Astra Image 3.0SI software to do the combining. 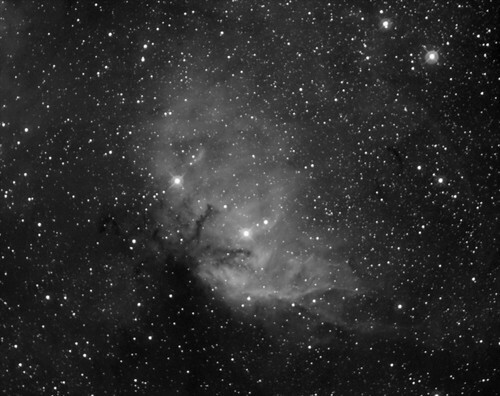 After creating the RGB image I did a small amount of post-processing in Astra Image 3.0SI. Deconvolution works wonders to bring out the sharpness, followed by a little curves and colour adjustment. This is mostly trial and error and personal preference, it’s easy to overdo post processing and end up with an over sharpened or too saturated image if you’re not careful. Voila, one pretty decent colour image of Jupiter, showing details in the cloud bands and the Great Red Spot (which is actually a pale pink colour). Notice the less abrupt edge to Jupiter on the right-hand side. Before opposition we are able to see slightly around to the night-side of the planet here and the cloudy atmosphere of the planet means there isn’t a sharp edge between night and day like there is on the Moon. This is probably the best image I’ve taken of Jupiter so far helped by the exceptionally good seeing on this evening. 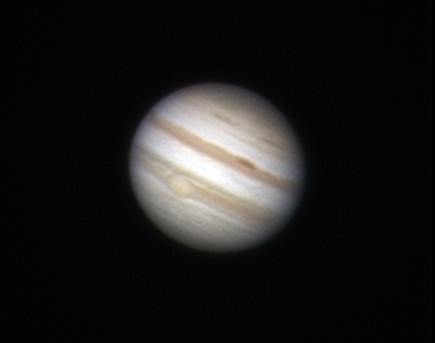 Hopefully we will get more good evenings as opposition approaches and Jupiter gets a little bit bigger. 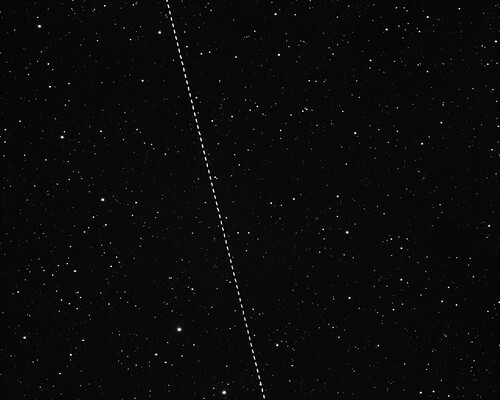 I will be out trying to better this and/or get some satellite events too, e.g. moon shadows and transits. Thanks to the power of twitter and retweets this image has had over 1500 views on Flickr! OK, I’m happy to release my new Astro Images gallery now. I’m using Flickr to store images, sharing, comments etc. I’ve written a WordPress plugin which uses the JSON feed from Flickr to display the images here. 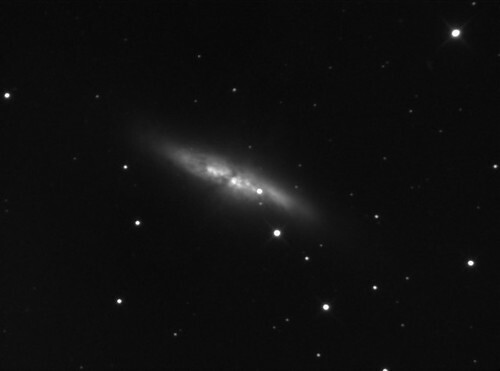 I’ve not moved all the images across to Flickr yet but I’m also having a bit of a cull as some of my earlier images, especially of Messier objects, don’t really look that good anymore. I’m planning to take better images of the objects this year. I’ve also reorganised the images into (I think) better categories. So, over the next few weeks I’ll be putting up old, reprocessed and new images onto Flickr and they will appear in the Astro Images gallery on here. Of course you can skip all of this and just go straight to my Flickr gallery if you want! My latest astroimaging acquisition is a Hydrogen alpha filter. This filter has a very narrow bandpass and only allows light within 13nm of a wavelength of 656nm to pass through it (normal human vision at night is between 400 and 600nm). Some types of nebulae (emission nebulae, planetary nebulae and supernovae remnants) glow particularly strongly at a wavelength of 656nm due to the excitation state of the hydrogen gas in the nebula. The advantage of using the filter is that it cuts out all light pollution and all ‘visible’ light and only allows the nebula and stars to show. The CCD chips in the cameras are sensitive to this light so you can achieve very high contrast images of nebula, impossible to achieve with filters that allow visible light through. 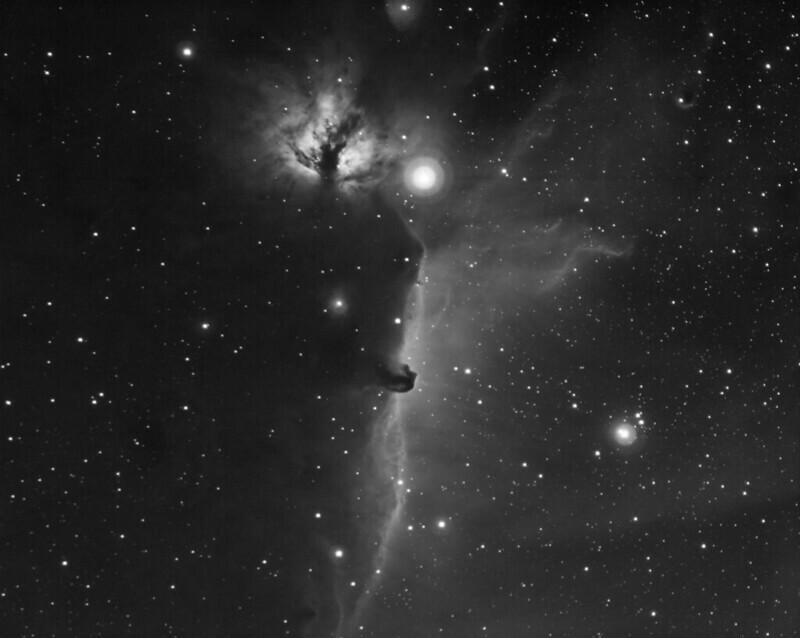 The images are inky black where there is no nebula so even the faintest wisps can show. 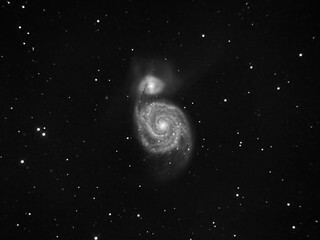 Over the coming weeks and months expect to see images taken using this filter appear in the astroimages gallery. I’ve invested in some colour filters and a filter wheel for my astroimaging setup so I’m going to be posting some colour astroimages up over the coming months, I’ve already posted my first LRGB image of M27 into the gallery. I thought I’d take a few words to explain how this works. The CCD camera I have is monochrome, these are generally better then singleshot colour cameras as they have a higher resolution and there are no filters in front of the chip. So to get monochrome images it’s just a case of capturing multiple exposures and stacking them in software to increase the signal to noise ratio. To get colour you need to take monochrome images through red, green and blue filters. The filters are very precisely made so they only pass through the correct wavelengths, they also block any infrared light which the cameras are sensitive to and can cause problems. They are also manufactured to ensure that they focus the light from the telescope to the same place, so you don’t have to refocus when you change filters. The filters are held in a filterwheel, this is a mechanical device driven by batteries that rotates the filters into the lightpath at the push of a button. So there’s no requirement to dismantle the setup to put in the next filter. So what is LRGB? An LRGB image is made up of Luminance data (monochrome), Red, Green and Blue data. What you do is capture a lot of high quality monochrome data. This provides all of the detail in the final image. You then capture some data through each of the coloured filters, this data can be with much shorter exposures and far lower quality. This colour data can then even be binned, i.e. each square of 4 pixels is summed together to make 1 pixel. You can also blur it with a Gaussian blur filter to reduce colour noise in the final image. Software is used to combine the three images taken through the coloured filters into what looks like a blurred, low resolution colour image of the object. Now comes the clever bit, the human eye is really good at picking out detail in monochrome images, it’s rubbish with colour. So what you do is layer the colour behind the monochrome (luminance) data. Lo and behold you have a high resolution colour image!